Decks are great, and more homeowners either have a deck or want to have one installed than ever before. Just like any part of a home, decks also need to be maintained, especially wood decks (and yes, even treated decks). Water, humidity, wind and general wear can have your Overland Park deck looking beat up after only one season without proper care and protection. Fortunately, there are easy ways to make sure your deck looks it’s best and remains your outdoor oasis for entertaining and relaxing. Watch your deck for signs of deterioration. It sounds obvious, but it’s really important. Foot traffic, pets, kids, weather and even sunlight can have an impact on the health of your deck. 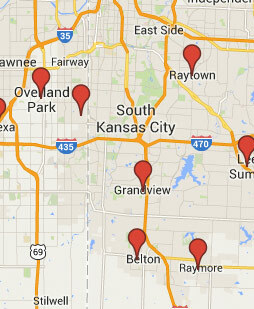 Overland Park decks also have to contend with severe weather that can cause buildups of debris and damage sealants. Keep an eye out for all the things that raise red flags. Nails that work their way out can cause injury. Insects can make a home out of your deck, dead leaves and vegetation that decay can leave stains. Air pollution can also cause stains, sunlight exposure can cause discoloration and mildew can grow on the undersides. Make sure to watch for all of these signs and remember them so that you can build a seasonal maintenance plan that works for your particular Overland Park deck. Regularly cleaning will make for less maintenance in the long run! Don’t let plants and vegetation grown in places where it shouldn’t be near your deck. Keep all the leaves and other degradable materials, including food, from staying on the deck. Treat your deck how you would treat indoor hardwood floors! By providing regular maintenance, and cleaning out the cracks, you’re more apt to notice any problems that are taking place too. Plus, you’ll feel better about how your deck looks and be proud to use it as a space for entertaining. Applying a sealant is usually a once per year process. You’ll need to hit up your local hardware store and find the sealant that works best for your needs. While there are drastically different colors and looks available, it’s even more important to think about how long the stain will last. You should also consider if it provides extras like UV protection for decks in direct sunlight and if it can stop fungal growth. Some of the more expensive sealants can provide multiple year protection under normal use. While it’s up to you which you choose, you need to make sure that your deck is sealed to make sure that it stays in useable, beautiful condition. This can be the fun part – before you seal your deck you need to make sure to get it really, really clean. You don’t want to seal in any debris after all. So you can either get down and scrub every bit of it by hand, which might be a great job for your kids, or you rent / borrow a pressure washer. While the pressure washer may cause a little more wear, it’s going to get the deck a lot cleaner, take a lot less time and be a heck of a lot more fun. Make sure to start at the lowest setting that will work, say 500 psi or so. Make sure to get every nook and cranny, stair spindles and hand rails. After you’re finished power washing your Overland Park deck, let it dry for around 3 days before applying your sealant – again, you don’t want to seal in moisture. This sounds ridiculous, but it’s actually one of the most important things you can do for your deck. Read the directions on any product or pressure washer you use. Power washing against the grain of your deck can cause damage that needs to be sanded away, for example. Applying deck stain in the wrong temperature weather or before it rains can cause it to be sticky for weeks, and you may even have to reapply the coat. Remember, Google is your best friend for finding additional information on the type of wood you have and the right products to use with it. Take all of this advice, and your Overland Park deck can stay beautiful for many years before needing any serious maintenance or repairs. Keep enjoying the outdoors, keep entertaining, and keep making memories by keeping your deck in top shape! Every new Kansas City deck has to face the elements and stand the test of time. In conditions where the transition between hot and cold can be a mere matter of hours, it’s important to maintain your deck! – Decks that look faded from the sun and weather need to be restained, it will help the look and keep the material in good shape. – Thinner stains will need to be replaced more often than heavier stains. Keep these tips in mind when maintaining your Kansas City deck to give it the longest possible life! Getting the Right Stuff for a New Deck Kansas City Style: Composite or Wood? Your sitting outside having a drink with your neighbor, it’s a warm summer night at sunset and you’re sitting on his brand new, mahogany-colored wood deck. It’s created the space for your families to gather outside during these perfect evenings, and now it’s leading you to thinking of getting one for your own home. If you’ve had this experience then maybe you’re ready to start planning for getting your own Kansas City deck. After you’ve made the decision to get one, maybe with an idea of how it might look already in your head, it’s time to start thinking about the materials you want to use. The Right Stuff: Composite or Wood? There are two basic types of decking material: composite and wood. Many have preconceptions about which is better than the other, but in truth, it all depends on the quality of the materials that you choose, what you like, your budget, and the environment where you live. Both materials can offer long life, minimal maintenance and excellent aesthetics when properly selected. Composite is a blend of natural wood particles and plastic, and it is available in solid and hollow planks. Hollow planks tend to be less expensive but are capable of holding water which can lead to decomposition. Because they’re hollow though, they also tend to expand and contract less often than their solid cousins. The solid planks tend to to feel more solid and more often evoke a feeling of authentic wood. A composite deck will often be more expensive new than a wood deck, especially after you get all the extras you need like UV protection and scratch resistant surfacing. But the savings come in when you start to think about upkeep. Composite usually requires less maintenance than it’s wooden counterpart, often in the form of scrubbings and power washings. Most of these materials are not designed to be painted, so taking care to protect them from fading and being filled with water is essential (and why you should get the extra protections up front!). Wood is classic, offers a variety of different looks and feels, along with different maintenance requirements depending on your choice of wood. No matter what kind you get, you will need clean it just like the composite (though you can’t use a pressure washer on it like you can the composite), and to stain and seal the deck about once every three years to keep it from rotting and keep it looking in good condition. Selecting a cedar deck can offer both beauty and that great scent only cedar produces, plus it’s less likely to rot. The drawback is that this type of wood doesn’t work well, and tends to break down, in more moist conditions. 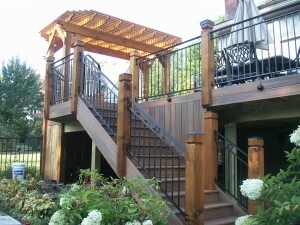 Higher end decks like mahogany hold up well to all the elements and don’t often break down from being exposed. If you’ve got the budget for it, these kinds of decks really deliver on the promise of value and long term satisfaction. Whatever you decide to go with, Alexander Homes is here to help you build it. Decking Kansas City for more than seven years, we know all of the best materials to use and would love to discuss turning your vision for your perfect home into a reality. Alexander Homes, Kansas City Missouri, takes great pride in making sure that you as the consumer are fully aware and knowledgeable about both the projects you want to do and the products you want to use! Whether you are in the greater Kansas City Metro area, Western Olathe or the country side of Smithville, Missouri – we are always excited to hear your questions, concerns and thoughts in moving forward with what you would like to do. A common question that we are asked is whether or not the investment for a deck or screened in porch will add value to your home. No one wants to put money into a project and feel like it is at a loss, and that there will be no return. The reality is that you cannot look at it as an investment in vs. investment out. Measuring dollar for dollar will not help you make the decision and in some ways it will even hinder it. To help explain and provide some foresight to what to expect when looking at adding onto your home we caught up with Steve, our favorite Real Estate Agent! Adding on another room and another bathroom are surely easy to know that they will add value to your home. But, after further discussion with Steve, we found it not to be a simple black and white answer. He wanted to make sure and convey that what you have to remember when looking adding on that deck or screened-in porch is actually how it will attract future/potential buyers for your property If you think that at some point you will want to sell your property, remember that looking at the project you would like to undertake, the more versatile, the better. The value of your home is factored by comparisons in the area, size, the neighborhood and acreage, and yes, these are all things you can weigh out dollar for dollar- but what happens when there needs to be a deciding factor? Yes, you guessed it, that spacious deck or coveted screened-in porch hideaway. There is just something about watching that sunset from your custom, built to last, deck. A deck that is far unique to you and your moments! If you have more questions, please make sure to send them our way! We would love to hear them! More than ever, local business supporters have been vocal about supporting the local companies. The idea of making sure that your dollar stays in your area as a dollar earned is driving customers to look for someone local! And that is exactly why you should look into letting Alexander Homes do your next remodel, addition or deck! Jeremy Alexander and Randy Alexander started this business close to 1o years ago, and the business has succeeded in various ways thank you to our local customers! Jeremy is a father of two wonderful children, a daughter (3) and a son (10 months) and married to Katie- from Tonganoxie, Kansas. They have settled their family in the Independence area and plan on living, working and retiring here. They are a God-fearing family and love Friday night movies, play time with their kids and taking adventures together. Jeremy enjoys improv comedy at a local venue and tends to make friends with everyone he meets. Randy is a father of two. A daughter, and his son Jeremy. Randy has been married to his wife for 37 years and they both have lived in the Kansas City area all of their lives. They have an adopted greyhound named Vaughn and a mixed breed named Bogey. Besides the grandchildren, they enjoy a good movie as well as a good book. Alexander Homes has given Jeremy and Randy a rare opportunity to work together as father and son, to provide you with the best solution possible for you and your family! The pair of them run this company with honesty, integrity and treating our customers like family! Please feel free to leave any questions or comments and if you are looking into a new project in your future please let us know! 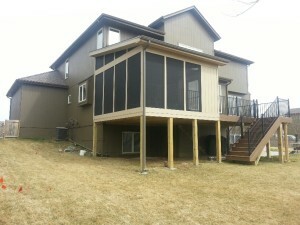 Alexander Homes is a well known contractor for designing and building decks in the Kansas City area.